Perhaps you have always dreamed of becoming an event planner and are wondering where to begin, or maybe you are your family’s unofficial party planner and host extraordinaire. Either way, you may be lost as to how to start putting your skills to use when first starting your own event planning business. Event planning courses—classroom style or online—can provide valuable, much-needed knowledge about how to be an event planner. You can find these programs at many universities, local colleges, adult education programs and through various online resources such as QC Event School and, surprisingly, Youtube. If you are new to the event planning industry, select something more general for an overview. If you have some experience in event planning and want to focus on a particular type of planning such as special events, corporate meetings or fundraisers, then explore courses that are specialized and will provide knowledge in that particular area of interest. W It is a catch-22 that no one will hire you without experience, but you need experience to get hired. There is an answer to this, and that is to volunteer your time learning the ins and outs of event planning as you build your resume. 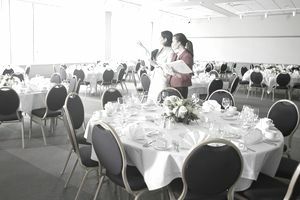 Many nonprofits and charities host events to raise awareness and to fundraise, and the beauty of being an event planner is you can choose the styles of events you want to volunteer for, since nearly all industries host them. Nonprofit organizations do not have the funds to hire additional event planning staff; their focus is on raising as much money as possible. Volunteer to help them plan the event and put your skills to work. Work the event and gain hands-on experience. Ask questions and learn as much as you can. Spread the word that you are thinking of becoming an event planner or launching your own event planning business. Get contact information from vendors and business cards from those involved at the charitable organization. Volunteering is a great networking opportunity in addition to helping the community. An important topic to mention is one that considers the confusion around event planning certification. There is a general misconception that, to begin working as an event planner, you must gain certification. It is not true. Most event planning certifications require at least three years of experience before you can even take the test. Event planning certification is a measure of your knowledge of the industry and your experience. Once you become certified, you may use this designation after your name and title to reflect your knowledge of the industry, but it is far from a requirement. Once you have a few years of experience, you may want to consider certification as either a Certified Meeting Professional (CMP) or a Certified Special Events Professional (CSEP). CMP is the most widely recognized certification in the meeting and event planning industry. Candidates must have three years of event planning experience and a current full-time job in the industry. CSEP focuses on special events and is the only other openly recognized certification in the event planning industry. Candidates require three years of experience in the industry and must have had employment in the special events industry in the last twelve months.